NZ Bach with 3 double bedrooms, new and well funished with 3 double beds, 2 bathrooms, plenty of parking and outside living with BBQ's and outside shower. Good area for washing dive gear and drying and storage of boat etc. 5 min walk to Cooks beach that is very safe for children and lovely walks. 1 mins to easy boat ramp and access to Mercury Bay and wider outer islands for great fishing and diving spots. 10 mins to HaHei, Hot Water Beach, Ferry Landing to catch ferry to Whitianga where you can shop and be entertained. Cafe's handy and Purangi 9 hole Golf course 10mins away ( great country course). Hi we are couple in our 60's with 3 grown children who are all married and we have one granddaughter. I have been the owner operator of Annette's Hair Studio in Albany North Shore Auckland for 25 years and Rob is now a storeman for Noel Leemings Wairau Park North Shore after being a manager of a General Store on the Armed Forces Bases for 35 years. We love all love our family Bach and we stay there fortnightly in the winter and any weekend that we don't have guest in the Summer season. Our daughter lives in Hobart Tasmania with her husband of 9 years, one son is owner operator of Wanaka Marquee and Party Hire with his wife of 10 years, other son is owner operator of a lightening company for live theater and stage concerts with his partner of 5 years. They all love our family bach and visit when ever their lives allow it which is not often enough. Our property is a family owned and loved bach and it is in a quiet family area with good neighbours who watch it for us and manage it during the busy holiday season. 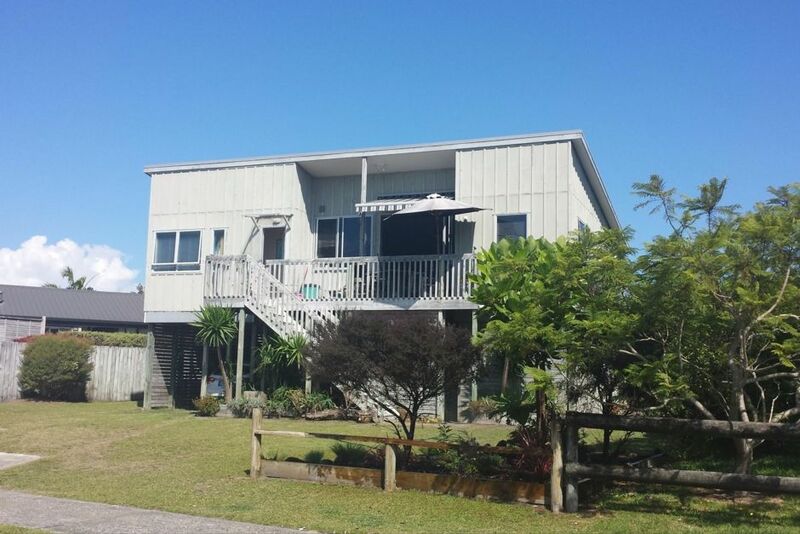 It is a close walk to the safe Cooks Beach or short drive to the boat ramp which is well maintained and used. Our bach has lovely comfy beds and plenty of bedding for all which is well maintained and cared for. I pride myself in our spotless place and leave it very clean and tidy for all guests and we expect our guest to leave it as they found it. We are on tank water but this is kept maintained and at a level so it never runs out of water, with a water filter for safe clean drinking. There is plenty of outdoor seating for all with good awnings for shelter for you and the inside of our bach. There is plenty of parking and even though upstairs the stairs are user friendly out the back for older guests and the cars can be driven around to these stairs for easy unloading and packing. There is a good hot outdoor shower for washing off after being to the beach. Plenty of room for playing games with the kids or there is gates on both decks for saver keeping of littleies ... so we hope those that stay enjoy all our bach offers and respect our family bach as we love it. Property had everything we needed for our stay. We had a wonderful stay at this bach. It is well equipped and an easy, short stroll to the beach. We appreciated the use of bikes and body boards. The owners are very helpful and great at communicating with you. Highly recommend! Spacious, comfy, convenient, well stocked kitchen. We had a perfect time, and winter weather cooperated just enough to allow us to enjoy sitting outside on the many decks! Super close to the beach, easy drives to the tourist attractions (Hahei beach for kayaking, Hot Water Beach). Wonderful holiday! Great property, everything we needed was there. Great property, everything we needed was there. Very clean and comfortable. Would love to visit again.